There’s already a lot of advice on the Internet about how to break into professional writing. I don’t have much to add. In my experience, at least, there was no magic formula or kung-fu technique that finally did it for me. All I did was keep writing, every day, while trying to get people to…… Continue reading Never Be Ashamed. 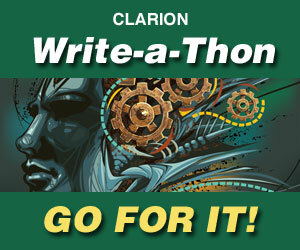 Writers, start your engines: the 2011 Clarion Write-a-Thon is now accepting participants. Our goal this year is to reach 80 participating writers, so please sign up at the official Write-a-Thon site. It’s free, anyone can do it, and it helps spread the word about Clarion. Not to put too fine a point on it, but…… Continue reading Write-a-Thon Time!